Shona and I have been busy recording and uploading Season 2 of our "It’s All Up From Here” podcast and boy, does this season pack a punch! The podcast is now all about family - not just parenting, because we realised that family relationships are at the heart of it all. We’ve had many incredible comments and responses to the topics covered so far - our most popular has been the recent two part episode titled How to Know When It’s Time To End A Relationship, where both of us talk openly about our recent, very personal experiences. Other topics so far include understanding Family Culture, How to Cope with Change, and managing Screen Time. Let us know your thoughts, we’ve loved opening conversation and sharing our passion for family and relationships because we know human connection is everything. If you have any topic ideas that you’d like us to chat about, email me or comment on this post! And if you love what you hear please subscribe and tell your friends and family, and review the podcast so other people can find it too! Shona and I will be opening the opportunity to become a sponsor of the podcast for Season 3, so if you have a family-related business that you feel would be beneficial to our listeners, don’t hesitate to email me to find out more. corner of my home, part 1.
corner of my home, part 2. Until I stopped it. That was when I went to Paris in 2006. When I left all that I knew to be safe. With distance I learnt that much of what I understood to be safe wasn’t safe. It was an illusion - an illusion “to keep me safe”. That’s a very hard reality pill to swallow. At this time of year, so many emotions rise to the surface. For me, I think of my original family and how we are no longer connected, I think of times spent together in the past, but mostly I think of my Mum. I miss her enormously at the moment. I want to hug her, tell her all that I’ve learnt this year through the experiences I’ve had, I want to tell her I understand now how much she did for us that I didn’t truly realise until now, and how grateful I am for her being my mum. I want to tell her that I wish she had been more self-nurturing, and that I’ve been wondering if she might still be here if she wasn’t so self-sacrificing in order to boost the lives of those around her. Mums are our original anchors. Literally - our umbilical cord was attached to their inner most sacred space which nourished us for ten moons. And until we find our own anchor within, we will always be attached to hers, even when she is no longer living. But I am feeling a significant shift within and all around. The more time people spend reflecting inward, the more we understand our society and ourselves, and the more we can be in life without trying to put anchors in material wealth, in beliefs, in events and in other people. We will be anchored in our own self - not ego, but ‘self’ - and we can form deeper, real connections through our intuition with those around us. 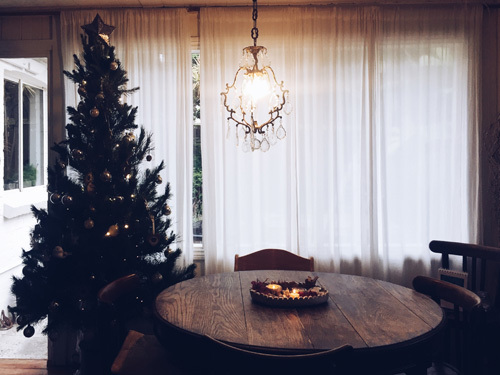 Christmas is one of those yearly events that I still find difficult to release anchor, even with my awareness and the positive changes we’ve made. It’s so ingrained in our way of life that I still find myself wanting it to be a certain way, to feel a certain way. I know it’s because the anchor is still there, and I’m slowly working on pulling it up and placing it back inside myself. Thank you Beth for sharing your wisdom in your book and extending your knowledge with all of us through our connection. It’s such great advice to carry with us as we move through the next few days. I have a number of beautiful projects in the works for the year coming to enrich and ignite that part of us that is yearning to be heard. In the meantime, I’ve created lots of content over the past month or two that will support you in your creative pursuits, I have listed them below. There has been much loss and endings this year - I’ve observed many long term relationship breakdowns, business endings, and life passings. For some it will be a tough time, which is why I cannot emphasise enough the importance of reimagining this week as a time for self- nurturing and nourishing - and if you don’t know what that means for you, to take the time to think and reflect on it. It’s a whole chapter in my book, which you can order digitally if you’d like to read it straight away. The second print run is on its way too, and I’ll continue to send out orders when they arrive. It’s not a book just for now, it’s for the whole year, so you’ll benefit from it now and for the years to come. PS. Yesterday I wanted to talk to my mum, hug her and be in her presence and last night I did just that in a dream. I feel like I just saw her, and today the grief has transformed. I’m not sure if it’s my connection to my heart space, but this is one thing I’ve been able to do whenever I’ve needed to since she passed. Perhaps it’s a side effect? I’ll see what I can find out and let you know - if so, it’s yet another incentive to strengthen it within us. New piano compositions on Patreon including the latest one I recorded yesterday. If you become part of the collective now, you’ll be able to download all 6 songs to create a playlist to listen to to strengthen your connection to your intuition - it will be a wonderful way to end and start the new year if you feel that deep desire to pursue your dreams but don’t know where to start. 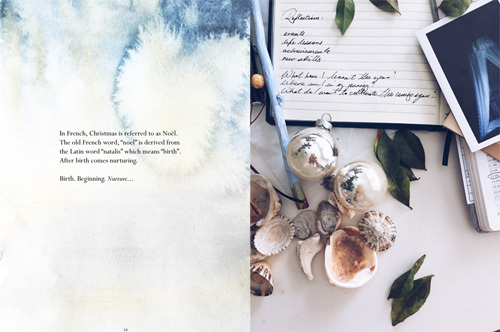 Reimagining the Festive Season, and interview between me and Kayla Robertson on the All Being Well podcast. 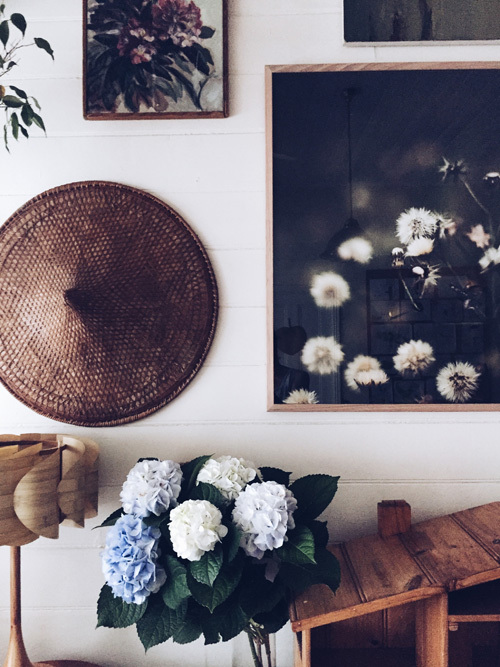 All about how to reflect, self-nurture and reimagine this time of year. Laly and her friend Mya enjoying some intuitive mark-making together, reminding me of Shona & I 'at play'. In fact, a photograph I captured of this joyful moment between the girls became the backdrop for our podcast logo. The beginnings of beautiful collaborations! All 8 episodes of the first season of Shona Smith and my podcast titled “It’s All Up From Here!” are now available. I’ve just finished having a listen to all of them - Shona does all the incredible behind-the-scenes stuff that is involved in making a podcast, so I don’t listen to the episodes until they are out there! It does make me feely slightly vulnerable but hey, I’ve had plenty of practice at allowing myself to experience vulnerability when it comes to putting things out there, so this is all part of the journey. I can say with all my heart that I have enjoyed being in conversation and listening to every single episode. It’s a big deal for me to say that - artists tend to be hyper-self-critical and nothing ever reaches ‘perfection’ (that’s because there is no such thing, but we forget that!). So I hope that comes through in the podcast and that you enjoy listening in. One thing I’ve thought about since listening to the episodes is that we have said this is a ‘parenting’ podcast because it revolves around our experiences with our own children along with Shona’s extensive experience & knowledge as a youth worker, however it occurred to me that it’s broader than that - it’s as much about parenting of ‘self’. Because essentially, while we are parenting children, a huge part of it is that we are also learning so much about ourselves, and this is strong in our conversations. And I’ve just written up some show notes for “Redefining Success” as I mention a number of resources in it that I wanted to be able to link to. Shona and I haven’t intended to include show notes, but I think I will write them up slowly when I have the time as I see the benefit of the notes. I’ll let you know when the other notes go live, but for now here are the notes for “Redefining Success”. So, if you haven’t already subscribed, you can listen on apple podcasts or whooska, and I’ve also included each episode on my website here. A big thank you to Shona for being my co-host and for all that she has done to make this happen - it has been such a joy to work with her over these months and I look forward to many more collaborations together! 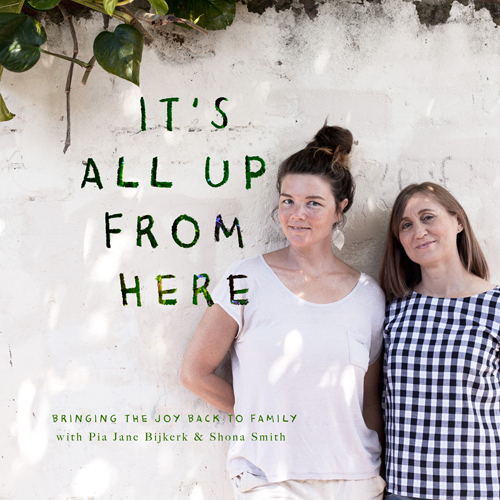 Welcome to Season One of the It’s All Up From Here! parent podcast, hosted by radio producer/presenter + ex-youth worker Shona Smith, alongside me, Pia Jane Bijkerk. This is a refreshing, unscripted & honest podcast opening up discussion on issues and topics of today, with the focus to bring back the fun to our parenting. Shona’s passion is to bring the joy back into parenting, for so many of us who feel overwhelmed and pressured to ‘get it right’. And my passion is to live wholeheartedly, guided by intuition. In this podcast we come together with honesty, openness and reality, without the bells & whistles or smoke & mirrors of social media. In fact, that is the topic of one of our upcoming episodes. This is Shona Smith! I love this photograph - it captures the humour, joy and warmth she brings everywhere she goes. Each time Shona uploads an episode, I’ll post it here on this page, but you can also subscribe via Apple Podcasts and Whooshkaa. Without further ado, a very big welcome to It’s All Up From Here! 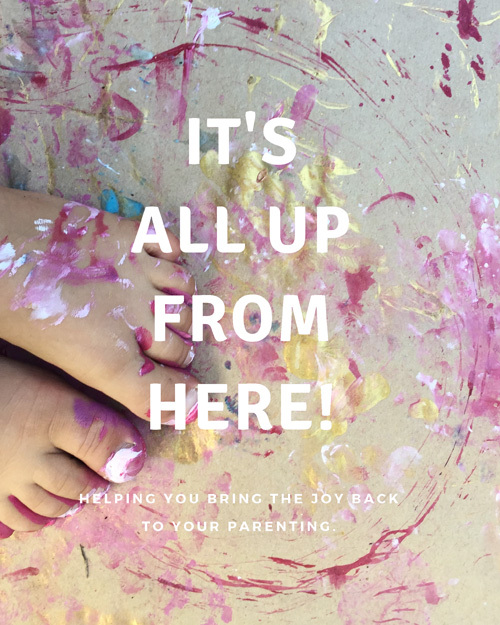 Bringing the joy & heart back to parenting.